LOKO GALLERY is pleased to announce the exhibition “grassroots prophet” by Ryo Shimizu. This exhibition is also the first exhibition of “Displace” the gallery curated two solo exhibitions by Japanese and Israeli artists as the partnership program of The Yebisu International Festival for Art & Alternative Visions “Invisible”. Shimizu focuses on the relationship between the space and its background, mainly using characters. Since 2011, he is working on installation using architecture, video, text, voice, based on fieldwork in Japan and abroad. 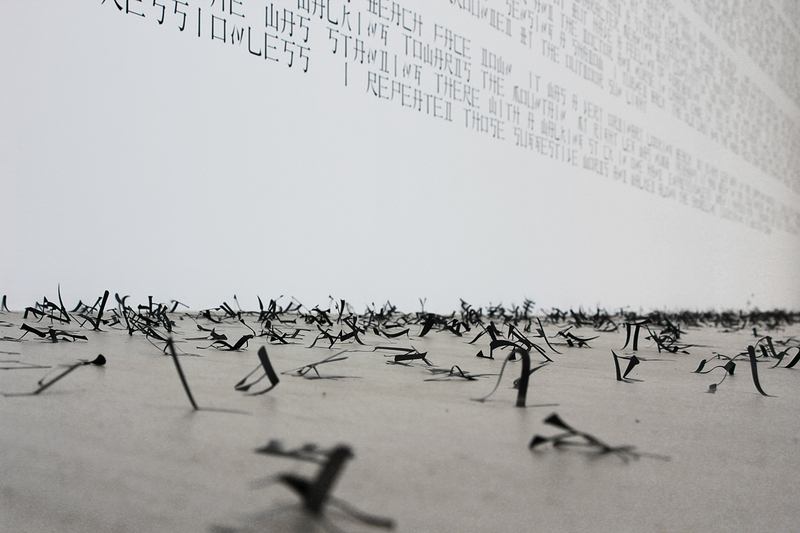 The title of this exhibition, “grassroots prophet” (nameless prophet) came from the idea that he thought of about “a reverse causal relationship”, that is, the past has no influence on the present or the future, and if the future is affecting the past, how ordinary people like us influence the past?A Chinese literary scholar, Shizuka Shirakawa argues in his book “Kanji(Chinese characters)” , “Kanji encloses a memory of the era of words far away before characters were born”. While Kanji and characters conceal such magical elements, and also it can be said that it is a tool that penetrate into everyday life or that is a symbol without consciousness. Shimizu handles characters as a material of creation because he thinks that “unconsciousness” or “atmosphere” that is lurking behind ordinary space from ancient times could be visualized. In this exhibition, he mainly considers the interviews with “Wansei”(Japanese who was born in Taiwan during the Japanese colonial era) whom the artist met during in the artist residency in Taiwan. He will also show a session with a Wansei, Ms.Yoko Nakada, known as “Reverse singing grandma” and the video work borrows typical example sentences from English teaching materials in the installation using the multi-layered structure of the gallery space. He was born in Kagawa prefecture in 1977, lives and works in Kanagawa prefecture. He focuses on the relationship between the space and its background, mainly using characters. Since 2011, he is working on installation using architecture, video, text, voice, based on fieldwork in Japan and abroad.